Assessments are an integral part of e-learning courses. It’s not enough if you include an assessment in your elearning course, you also have to provide effective feedback in order to make the learning experience worthwhile and help reinforce learning. Creating an e-learning course using Lectora gives you the choice of including 9 gradable question types, and 3 non-gradable (unscored) question types. You may choose to display feedback after each question or disable it. 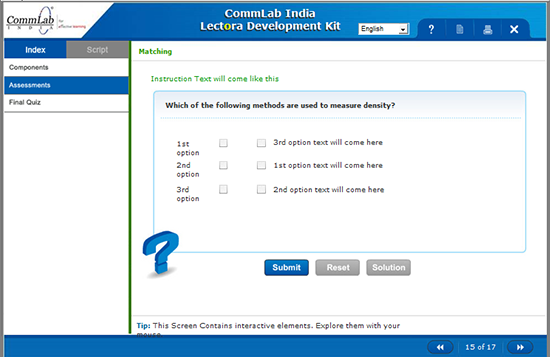 Lectora also has the capability to assign different points to each question in the assessment, and display randomized questions. 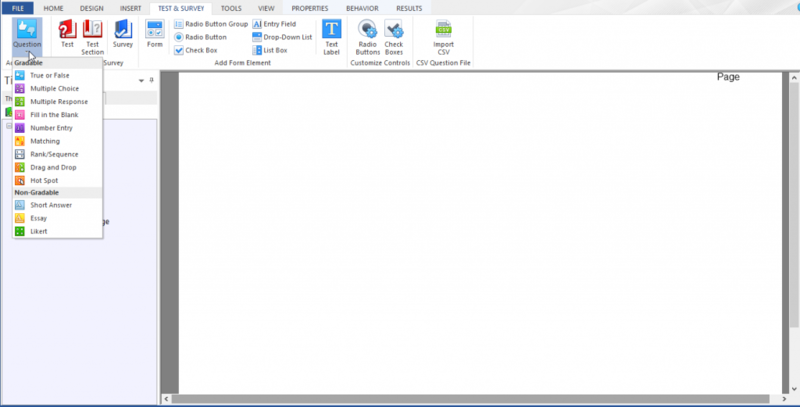 Read on to know more about the different types of assessments that can be created using the Question Creator in Lectora. True/False questions are a great option when you are assessing learners on factual knowledge or policies. Radio buttons in Lectora are used to design such questions. True/False questions are easy to grade as there are only 2 pre-defined choices to each question. When the learner has to select one right answer from various possibilities, a multiple choice question is used. You can use a drop-down list or radio buttons to create MCQs in the e-learning course. There is one correct answer called the key and the remaining options are called distracters. Use this assessment type when there is only one correct answer and there is no ambiguity among other options. Multiple response questions (MRQs) are similar to MCQs but more than one correct response needs to be selected from a list of possible answers. You can use the List Box in Lectora to create multiple response questions. This assessment increases the difficulty level as the possibility of learners guessing the right answer is reduced. The learner gets points only if all the right options are selected. A matching exercise can be used to check a learner’s ability to remember relationships between objects or terms. 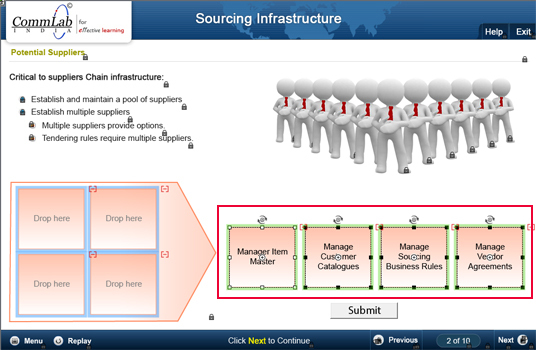 This type of assessment usually involves the linking of items in one column to items in another column. From the Question Creator, select the Matching option to create a match the right answer assessment. A fill in the blank question is used when you need learners to remember specific facts. Learners are required to remember and input the right answer. 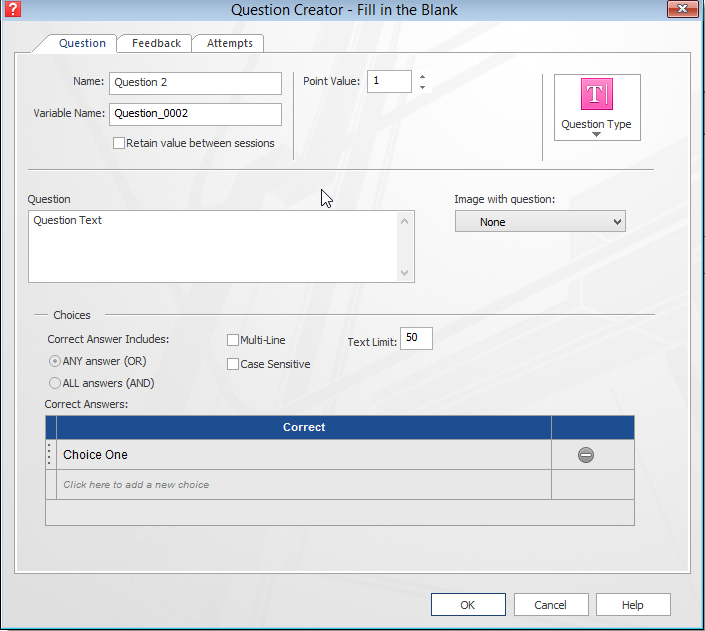 To create a fill in the blank question in Lectora, choose the respective option from the Question Creator. You also have the option to add an image with each question. This is an assessment type that lets learners interact with objects on the screen. 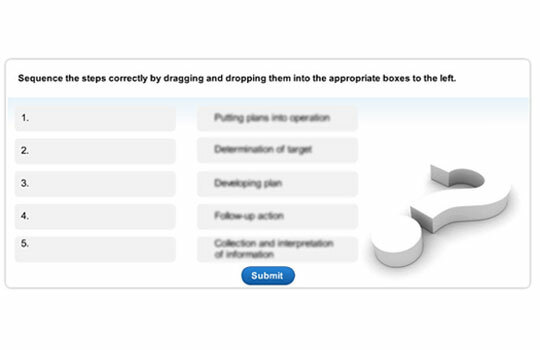 Learners have to drag an option from one part of the screen and drop it to another part of the screen. When you need to test learners on the steps in a process or a sequence of events, drag and drop is a good option. A Number Entry question requires the learner to specify a number as the answer to a question. In short, when you have to create a quantitative question, you can use the Number Entry assessment type. The number entry question is similar to a fill in the blank, but the difference is it lets you evaluate numerical answers. The learner will have to key in a specific number or a range of numbers. This question is typically used in mathematical calculations. Here is an example of a number entry question. Steve invested a certain amount in a bank and earned simple interest. If the amount was kept in the bank for 4 years what is the interest that he earned? 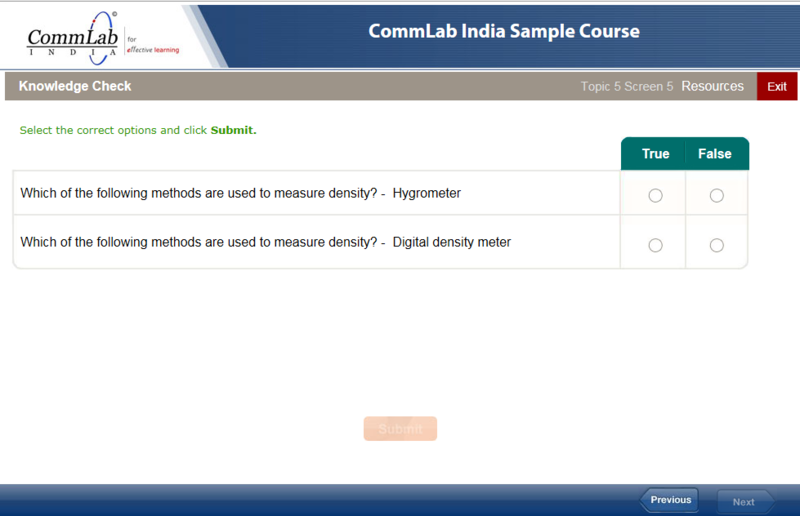 In the question above, the learner is asked to calculate the simple interest, fill in the answer in the box provided and click the Submit button. The learner is expected to enter $800 which is the interest earned on the amount for 4 years. This is an interesting assessment type which can be used to test a learner’s knowledge on a process or the steps to be followed. 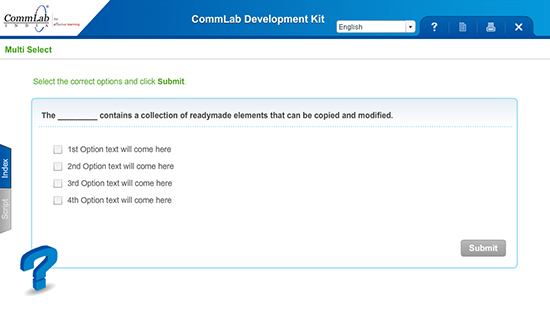 The learner is required to assign a sequence to the content. This assessment type is especially useful when you need to test learners on a safety or troubleshooting procedure to be followed. 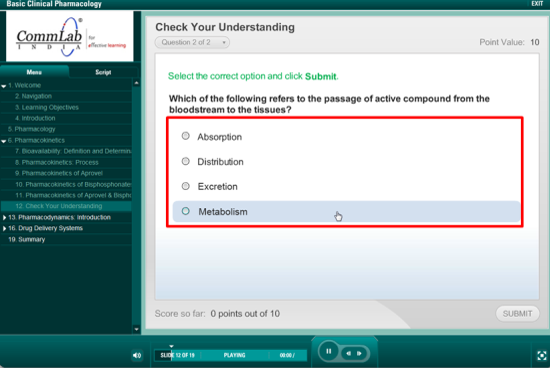 In a hotspot assessment type, the learner responds to the question by clicking on an image. A hotspot can be used to assess a learner’s visual knowledge. For example, in a manufacturing industry that manufactures sewing machines, you would want learners to identify the different components in a sewing machine. You could display an image of the sewing machine and ask them to identify a particular component. The learner will have to click the right spot on the image where each component is placed. You could also use it in application training programs where learners need to identify the correct option to click, or in product training where sales teams need to know how to operate the product or explain different features. Lectora Inspire offers options to create sophisticated questions and display appropriate feedback. In case of a summative assessment, feedback can be hidden and the results of the assessment can be sent to an LMS or even emailed to the employee’s supervisor. Whether it is following a differential marking scheme, randomizing questions, or limiting the number of attempts for each question, Lectora has all the options to make assessment creation in your e-learning course a breeze. Have you explored all gradable assessment types in Lectora? Do share your thoughts through the Comments section.